James Abram Garfield was one of the most extraordinary men ever elected president. Born into abject poverty, he rose to become a wunderkind scholar, a Civil War hero, a renowned congressman, and a reluctant presidential candidate who took on the nation's corrupt political establishment. But four months after Garfield's inauguration in 1881, he was shot in the back by a deranged office-seeker named Charles Guiteau. Garfield survived the attack, but become the object of bitter, behind-the-scenes struggles for power--over his administration, over the nation's future, and, hauntingly, over his medical care. 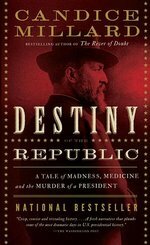 Meticulously researched, epic in scope, and pulsating with an intimate human focus and high-velocity narrative drive, The Destiny of the Republic brings alive a forgotten chapter of U.S. history.